Ready to get more interviews for all the hard work you put I applying? I get it. It’s exhausting. After all, they say it’s a full-time job looking for a job. And looking for a remote job is even more work. First, you have to know where to look for real job leads. Then you have to sort through the scam ads to find the real jobs. And once you find something that looks good, now you’ve got to beat out the competition, which often numbers in the hundreds for a single remote job. I keep applying and applying to remote jobs but never actually hear back from them. What gives? How can I actually get more interviews? It’s frustrating. I know. You want to work from home. And who could blame you? Not only do you get to save time and money when you ditch the daily commute, there’s the oh-so important ‘happiness factor’ that comes with remote work. But when you feel like you’re exhausting yourself looking for a remote job but don’t actually get anywhere, it can be tempting to throw in the towel. Instead, it’s time to rework your remote job search strategy. What you’re doing now isn’t working. Now it’s time to figure out why (and fix it fast!) so you can actually get more interviews. Chances are, it has something to do with one of these two factors. Fun fact: Nearly 80% of recruiters will google a potential hire before they invite them to interview. What Google says (or doesn’t say) about you can be killing your interview chances — fast. Your digital presence, aka your personal brand, is built upon your online persona. This includes your social media accounts and any other mentions of Y-O-U online (via news outlets, blogs, etc.). By the time a recruiter turns their focus to search engines, they’re looking for reasons NOT to invite you to interview. Keep in mind, if a hiring manager is snooping online, they already like your resume or application enough to consider bringing you in for an interview. Now they’re looking for a reason to toss you in the ‘no’ pile. Don’t give them one. If you want to get more interviews, you need to start taking your online presence seriously. Give your social media accounts a look and refresh them, if need be. Simple things you can do to make a better first impression online include using the same name on social media as you do on your resume and making your profiles viewable by the public. After all, you can’t get found if you’re using a different name or set to private so no one can find you. Don’t forget a professional profile pic! Now, this doesn’t mean you need a stuffy headshot in a button up. After all, social media is a place where you’re supposed to be yourself and have fun. But when you’re a job seeker, you need to keep in mind that prospective employers will make a snap judgement about you based on your profile pictures. Give them the right impression. A professional yet casual profile pic across all your social accounts makes a consistent great first encounter, whether it’s Facebook, Instagram, Twitter or LinkedIn and can help you get more interviews. Don’t forget to be careful what you share. Recruiters aren’t going to fault you if you post 10 pictures of your cat on the daily. But, they will think twice about bringing you in to interview if you post content that is negatively charged in any way. A good rule of thumb is to avoid sharing snaps of yourself where you’re under the influence or underdressed. Also refrain from posting or sharing anything that is political, contains foul language, or would be NSFW (not suitable for work). But, what if you have zero digital presence to speak of? No Facebook or Twitter. You don’t have a blog. And your name is common enough that when someone googles it, other people come up that aren’t you. Instinctively, you might think you’re in the clear. A lack of impression is better than a bad one, right? When a recruiter can’t find anything about you online, it can be a turn off. They want to learn more about you (that’s why they’re on Google after all). When they come up empty handed, it can make them wonder what it is you’re hiding. If you’re not into Facebook or Twitter, I get it. You don’t have to be. Instead, create a personal website that sets you apart from the competition. Even a simple one-page site all about you and your professional accomplishments can knock the socks off of even the most discerning recruiter. And it couldn’t be simpler or more affordable to get one done. Check out my no-fail guide to creating a personal brand website that helps you get more interviews. You can get yours up and running in less than a weekend! Now, when a recruiter googles you, the very first thing they’ll see is your own website and not a whole lot of nothing. Your own website allows you to control your professional narrative better than Facebook or Twitter. After all, it’s created by you and contains only those things you want others to see. Before you’re invited to interview, you need to send in a resume. Your resume is the single page of information that will determine whether or not you even make it onto a recruiter’s radar let alone get an interview invite. Right! Chances are, you’re overthinking your resume. You’re likely taking up too much considering its format and not its actual content. But, as with most things online, content is king. Today’s recruiters and hiring managers largely use an applicant tracking system (ATS) to help them sort through a sea of applicants. This is especially true for remote roles where there are often hundreds of resumes submitted for one job. Manually going through so many resumes is time consuming and ineffective. ATS, on the other hand, streamline the resume sorting process by using keywords. You, as the job seeker, submit your resume to the ATS. The recruiter then logs into the ATS and filters through resumes (like yours) by searching for specific keywords. For example, let’s say Recruiter Rita is looking for a graphic designer to work remotely for a mid-size online publication. In the job ad, it states qualifications included knowledge of Photoshop, InDesign, and Illustrator as must haves. So, Recruiter Rita tells the ATS to find all the resumes that mention Photoshop, InDesign, and Illustrator. Now the pile of 300 is widled down to a more manageable 50. Rita can now manually view the resumes or filter them even further with additional keywords. If you can get past the ATS, you can get more interviews — guaranteed. Now, this is probably where you’re wondering how the heck do you know which keywords to place in your resume so you get past ATS? Good question. Look no further than the job ad you’re applying to. When an employer places a job ad, they’re essentially describing their ideal employee and the traits, skills, and qualifications they need to get the job done. As a remote job seeker, it’s your job to pull these keywords from the ad and place them in your resume. This helps you gain greater visibility with the ATS and increases your chances of getting seen by recruiters. So, quit sending out cookie cutter resumes to all the remote jobs you discover. Instead, carefully craft a keyword-rich resume for every individual job you apply to. Yes, it takes more time but you’ll actually save time in the long run when you finally get callbacks and interest from the resumes you do send. Need a little more help? No problem! I’ve created a post that explains all about crafting a keyword-driven resume that helps you land more interviews here. Don’t get discouraged when you keep applying to remote jobs but never hear anything back. Instead, try a different approach. Chances are, a change to your digital presence or a keyword-dense resume will do the trick. Your turn. Are you applying to remote job but not getting callbacks? Let me know in the comments below! P.S. This post contains affiliate links. Learn more about them in my disclosure statement. 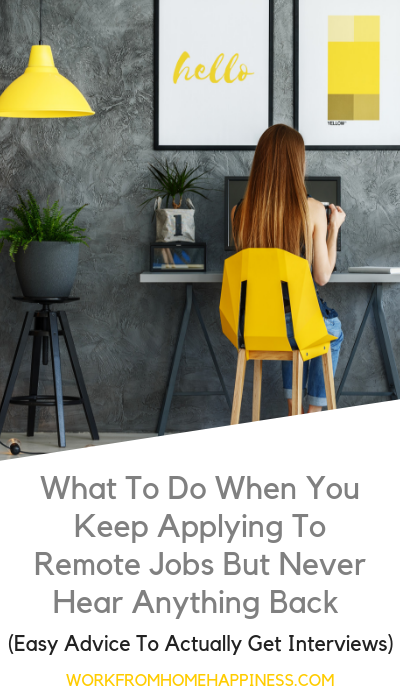 The post Get More Interviews: What To Do When You Keep Applying To Remote Jobs But Never Hear Anything Back appeared first on Work From Home Happiness.